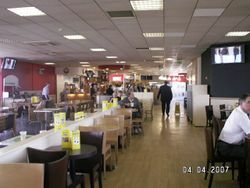 In this section Motorway Services Online takes a special, teary-eyed look at Leicester Forest East, a special service area which is set to be closed at some point. This was originally written on the basis that the services would only be open for a few more years. Seeing as it's not going to be like that now, it all seems a little odd, but the section will be updated again if there are more developments in this area. Motorway services were once a great part of Britain. Travelling down the M1 and stopping at Watford Gap was once a novelty, and the only thing better than it would be seeing the tower at Forton or eating at one of the few services which allow you to do so while sitting above the motorway and admiring the view below. Leicester Forest East is the beacon of those much-talked about 1960s dreams and excitement - a world where nothing couldn't be solved with concrete and trees were just seen as a nuisance. It's a shame, then, that as Ross's frozen food moved out and Welcome Break took over, they felt the need to standardise it. It makes sense from a commercial point of view to bring it in line with more modern services, but in doing so they were ruining what was an important piece of history. Fortunately karma came in and no matter how hard Welcome Break tried, they couldn't hide the quirky features and ageing looks which plagued the services. For several years you couldn't leave the services without walking through the shop: this wasn't by design, but they didn't have enough space for a corridor. This was made worse by the fact that most of the facilities were upstairs, again because there wasn't a lot of room. What Welcome Break had done is modernise it, but inadvertently left it as an oddity, which wasn't a bad outcome at all. Perhaps the best description would be to say it had all the charm of Medway, but still with a beating heart. I suppose LFE is the less fortunate, overworked brother of the Kent-based service area. What Leicester Forest East didn't know is that the road it straddles was going to be the source of its downfall. 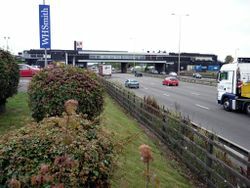 Since the services were built, a new junction had opened just north of the services to allow a northern bypass of Leicester to be formed. The junction immediately to the south of it, where the M69 joins, has managed to somehow grow over time. The result is that the road passing beneath the services is a mad panic at best. The road was recently widened, but the presence of the services means that the hard shoulder had to be removed. This, and frequent overhead signs for the two major junctions, help make the road feel even more chaotic and claustrophobic. Matters were made worse by the services, which act like a small child standing on the frantic hosepipe that is the M1. And it's this which is threatening the future of the services. For the past 10 years there have been talks of widening the M1, which would need the services to be demolished as they currently sit right next to lane one. A different set of plans suggested that this wouldn't be necessary, but the M69 junction would need free-flow links to the north. The first plan for these links would have taken away the lorry park for the services and would have involved a new exit being built at the southern end of the services, which then tunnelled under the existing entrance road. As ever, LFE is the site of an oddity. Those plans were thrown out by local residents who thought the new roads would be too close to their houses, so the Highways Agency were sent back to fix this. Their conclusion was that the sliproads would either have to be built on top of the services, or join so close that they'd have to be closed anyway. By 2007 it was decided that the services would be closing around 2011, bringing an end to the life of one of the most popular services around. Our government, whatever colour they may be, has never been the type that likes to spend money on things of use to us, and that's why demolishing the services seemed so brash. Thanks to various reviews and studies the plans were put on hold until at least 2017. The services will still need to be closed, but not as soon and not as brutally. It's good news for Leicester Lovers, but anyone who was hoping that they'd soon be able to use this bit of the M1 without taking a deep breath first will have to keep on waiting.